My guinea fowl keets hatched out on Thursday and by Sunday a couple of the keets had droppings attached to their vent area which if not dealt with can quickly form into a large clump. This has happened before and we ( my husband and I) have to pick the keets up and squirt water at the clump and then gently scrap it off. This is not nice for the keet or the scraper – me! Although I have learnt alot about guinea fowl over the last few years, I do not profess to be an expert. 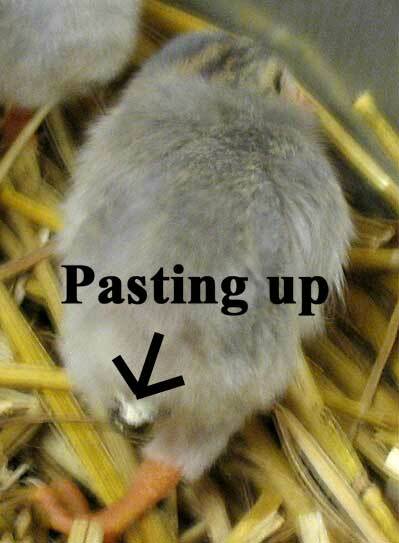 I didn’t know why guinea fowl keets got droppings attached to their vent area so I decided to visit the guinea fowl forum and ask the question. JeanM’s response was, “Sara, when I kept my keets in a brooder box they never got the pasties. When I just sectioned a place and gave them more room they seemed to get pasties. I concluded (right or wrong) they were warmer and snugger in the small warm area box and that kept them from the pasties. The bigger area and directly on the floor area had more drafts…? I would like to thank Lisa, Jean and Frit for taking the time to give me their advice. Two of the keets bottoms were quite pasted up so on Sunday night my husband held the keets one at a time, whilst I squirted their bottoms and removed the droppings (I get all the good jobs!!). From past experience we have learnt that if we do not remove all of the droppings then the pasting up will return. This morning I had another go at wiping the keets bottoms and managed to do a good job all on my own. Lets hope, for my sake as well as the keets that the pasting up does not return!